A cultural event in the former cow-house connects contemporary ecological art with the local traditions. We want to bring together the local (agri) cultural activities and the international ones. 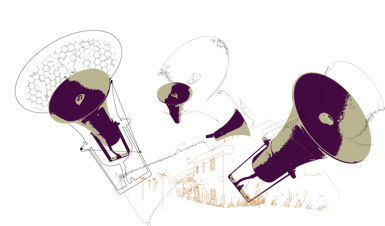 This year's workshops are focused on beekeeping, wind energy, and radio art. The workshops take place from Wednesday till Saturday, 10 AM to 6 PM (Diafilm Sound Robots on Friday from 10 AM to 6 PM, with the public presentation at 9 PM). You have to register in advance for the workshops, the afternoon and evening programs are open, without the registration. Organized by yo-yo with cooperation of Col-me, Atrakt Art, 2B and Okno. 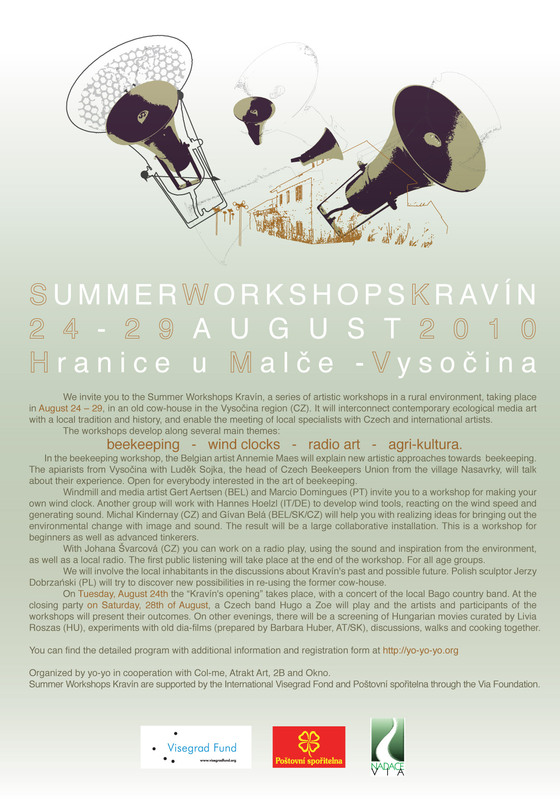 Summer Workshops Kravín are supported by the International Visegrad Fond, Poštovní spořitelna through the Via Foundation. In the locality of Hranice and in the larger region, there is a lively beekeeping activity. The workshop aims at bringing together neighboring beekeepers and participating artists. Okno maintains in Brussels city beehives for artistic projects, and this translocal exchange of skills and expertise will be an interesting ecological communication point. Belgian artist Annemie Maes will explain new artistic approaches towards beekeeping. The apiarists from Vysočina with Luděk Sojka, the head of Czech beekeepers' union from the village Nasavrky, will talk about their particular experience. The aim is both to raise the cultural and ecological awareness and to investigate a permanent and sustainable beekeeping site in the region. The workshop is open for everybody interested in the art of beekeeping. Windmill and media artist Gert Aertsen, together with physicist-sculptor Marcio Domingues, invite you to an open air hardware workshop for making your own wind clock. These devices can be analog and digital, like scientific instruments or made from recycled materials. Sound artist Hannes Hoelzl coordinates an array of simple wind clocks on poles on the surface of the Kravín meadow. These will react on the wind speed and generate sound, projected across the field. Jakub Hybler assists in the physical programming and electronics. Michal Kindernay and Gívan Belá will help you realizing ideas for bringing out the sensibilities of environmental change with image and sound. The result will be a large collaborative installation. This is a workshop for beginners as well as advanced tinkerers and thinkers of all kinds. 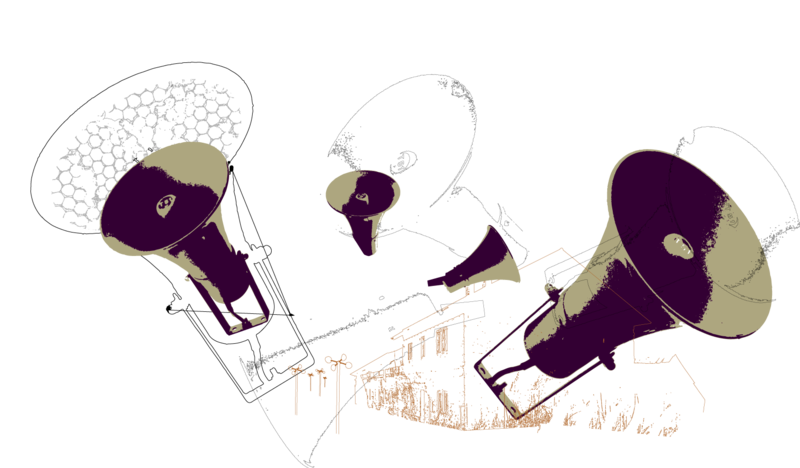 Czech artist Johana Švarcová will create together with local and non-local participants a radio play. The inspiration is drawn from the environment. The play will be presented during the final party, and parts of it will go on air in the surrounding villages. This workshop is open for all ages. dog or cat. If you have a great slide film at home you want to bring and present your composition for it on Friday evening, feel free to do so. At 9 pm we will present our compositions to the audience. An afternoon and evening program includes the lecture about the transformations of the Czech villages (Miloš Sládek), projections (Hungarian movies, film document Kravín), or concerts (Bago Víska country band, Hugo a Zoe), among other things. We invite you to discuss the kravín future and the re-destination of the buildings and the garden for cultural purposes.